This the 24 inch of Queen chess piece. One of part of chess pieces that stand beside the King and has important role in the game. Queen has unique moving. She can move in any direction, different with the others chess piece. Some people believe that Queen determines the end of the game. If you can maintain this chess piece untill final seconds of the game ends, most likely you will win the game. Just try it! The 24 inch Queen above is very popular for outdoor use, on a board with 12 inch x 12 inch squares. 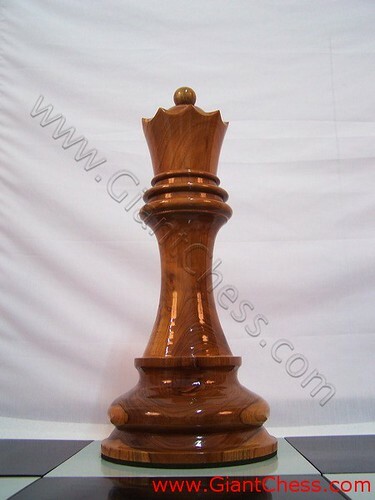 Brown and glossy chess piece looks so elegant and luxury. Made of Teak wood and very durable for outdoor also indoor chess game. Beside used as chess game, this chess pieces also suitable for gift. May be you feel confuse about some gift in special event for one of your family, friend, or someone special.